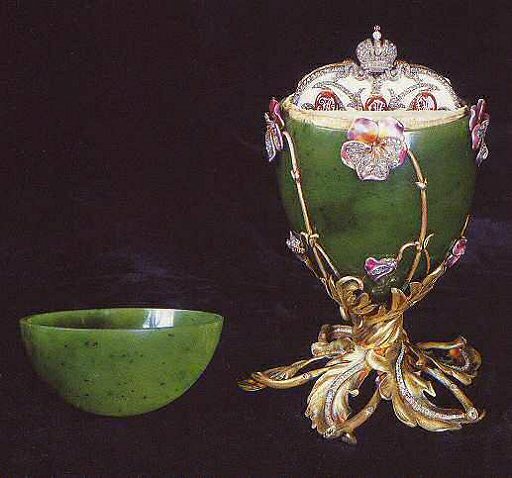 The 1899 Pansy Egg, formerly known as "Spinach Jade Egg", is made of nephrite, silver-gilt, diamonds, white, red, green and opaque violet enamel. 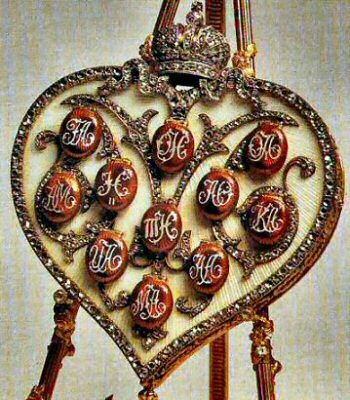 The heart surprise is made of varicolored gold, diamonds, rose-cut diamonds, pearls, strawberry enamel, white enamel and mother of pearl. This Egg stands on an bunch of golden twisted leaves from which stem five flowers and five buds of pansy enameled in violet in various nuances. The top part of the Egg can be opened to reveal the surprise, eleven tiny translucent strawberry enameled gold covers, each bearing its own monogram. They are connected by a large diamond M to form a decoration for the front of this plaque. The collapsible, heart-shaped gold easel is surmounted by a diamond-set Star of Bethlehem, within a wreath over the date, 1899. By pressing a button the tiny medallions are all opened, and portraits of each member of the immediate Imperial family become visible. Reading vertically, those in the front row are: Tsarevich George Alexandrovich, younger brother of the Tsar, and Grand Duke Alexander Michailovich, husband of the Grand duchess Xenia Alexandrovna, the Tsar's sister. In the second row are: Tsar Nicholas II and Princess Irina, daughter of Grand Duke Alexander Michailovich and Grand Duchess Xenia. In the third row are: Grand Duchess Olga Nicolaievna, the first daughter of the Tsar and Tsarina, Grand Duchess Tatiana Nicolaievna, their second daughter, and Grand duke Michael Alexandrovich, the youngest brother of the Tsar. In the fourth row are: The Tsarina and Prince Andrew Alexandrovich, brother of Princess Irina. And in the fifth row are the Grand Duchesses Olga and Xenia Alexandrovna, sisters of the Tsar. 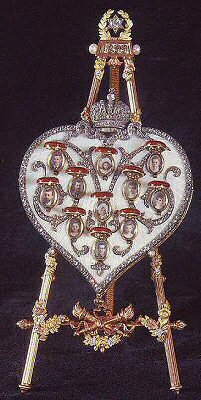 The heart miniature is backed with mother of pearl. In 1930 one of the ten Eggs sold by the Antikvariat to the Hammer Galleries, New York. 1947 First Egg bought from the Hammer Galleries by Matilda Geddings Gray, oil heiress, New Orleans, Louisiana. Given to her niece, Mrs. Matilda Gray Stream of New Orleans, Louisiana as a wedding anniversary present. 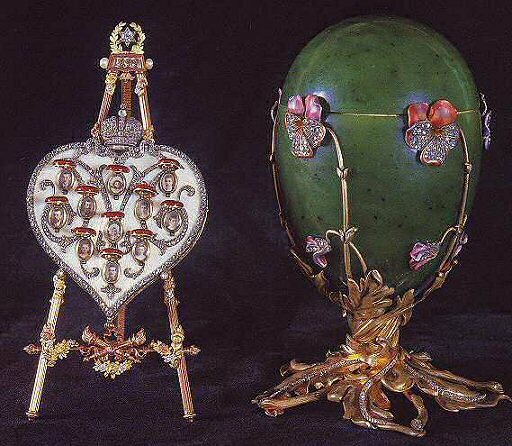 The Pansy Egg is one of the few significant Imperial Eggs to remain in a private collection.